It's November, and the weather is starting to cool...finally. So, that means that I can resume my quest for the perfect macaroni & cheese recipe. Last winter's clear winner was Tyler's Ultimate, which is topped with peas and bacon. 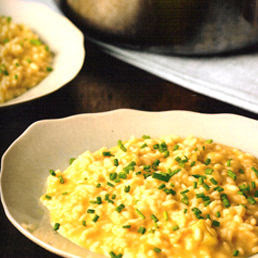 Last night, I tried Nigella's cheddar cheese risotto. While it's not exactly pasta, it is similar enough for me in that it contains all the satisfying elements of mac & cheese: starch, cheese, creaminess. The recipe calls for a bit of Dijon mustard. I didn't have any, so I used some of Stone Brewery's Ruination IPA Curry Mustard Grill Sauce that I had in the fridge. And, on my god was it good! Melt the butter and oil in a medium-sized pan and cook the onions until softened. Add the rice and stir a minute or so, then add the wine & mustard and stir until the wine is absorbed. Start add the stock, 1/2 cup at a time, letting each addition become absorbed as you stir before adding the next. Stir and ladle until the rice is al dente, about 20 minutes. Add the cheese, stirring until it melts. Take the pan off the heat and serve immediately. Sprinkle with chopped chives, if desired.